This entry was posted on Thursday, June 13th, 2013 by Frances Ryan. I have finally had my first pie. 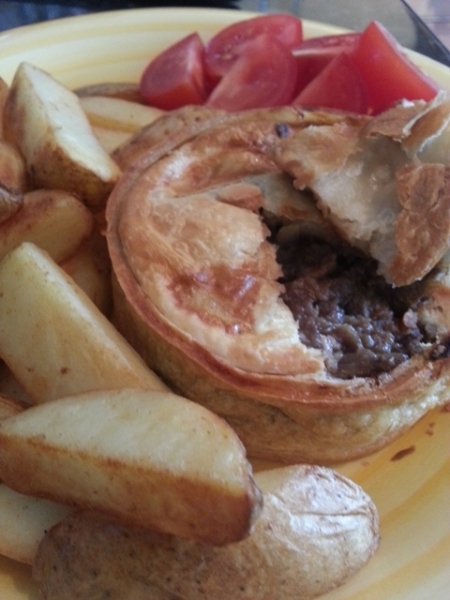 Well, my first Scottish meat pie at least. Pies are a pretty big deal in Scotland—in the whole of the UK, really. They’re served at sporting events much like hotdogs in America. And, much like hotdogs, the ones you get at sporting events or from street vendors tend to be of a lower quality. I think that’s why I’ve steered clear of them until now. I’ve just heard so many stories about the low-end cuts that go into some pies. I’ve heard stories about bits of grizzly cartilage and fatty bits of meat that need to be spat out. So, what prompted me to try my first pie, nearly 12 years after my first arrival in Scotland? Well, in true Scottish fashion, it was frugality! When I went to the Stirling Farmers’ Market last weekend, I stopped by one of my favourite stalls, Barkers’ Highland Beef, for some quality steaks. (So not totally frugal, to be honest.) As I was chatting with the woman behind the stall she asked if I was a fan of pies, and I explained that I’ve never actually had one before. Then, much to my happy surprise, the woman added a two-pack of highland steak and gravy pies to my bag—free of charge—so that I could try them. I had expected something a little bit like a chicken pot pie (yum!) which is loaded with gravy, potatoes, peas, and carrots (in addition to chicken). Instead, I got something that was all about the meat. It could have easily been eaten with my hands [Confession: It partially was] and was packed with high-quality flavour. I think I might try the second pie tomorrow for lunch, heating it in the microwave. I may regret that decision, but I want to find out how they microwave. And when I’m next at the market, I think I’ll be buying some more meat pies! Please feel free to take this as a positive endorsement for Barkers’ Highland Beef. I have been getting steaks, roasts, and sausages from them for nearly two years now and have never been disappointed! * I have NOT been asked to endorse Barkers’, and the gift of free pies was not made in exchange for a review of any description. I am merely a happy customer who wants to see her local businesses thrive. * The title of this post refers to a football chant here in the UK. Oh my! I’m so glad you’ve tried the pies and like them. I actually wanted to have steak and kidney pie while I was in England, but couldn’t find anything on the menus except steak pie. Perhaps they don’t use the kidney anymore? Now I’m looking forward to my first Scottish meat pie!! You can get steak and kidney pies here quite easily. Though I don’t know why you’d want to! We’ll definitely have pies when you’re here next! I think there was a time when traditional British food was a bit bland to the American palate, but that’s certainly changed in the last couple of generations. But then, America has her fair share of bland dishes, too! Gross! I honestly can’t imagine eating a kidney from any animal. I even make certain to find the kidneys of chickens and throw them away. Maybe it is a personal thing because of the PKD, but kidneys are the filters of all things toxic in the body. Really don’t want to eat one. Bring on the pies with anything else tho! Yum. Absolutely! Kidneys, liver, and hearts - ick! (And gizzards, too. Yucky.) I think that’s why it took me so long to try a pie; I feared it might have internal organs in it. I now know that you can easily find nice steak pies, and they’ll be kidney free!